Every post or picture I share is met with all kinds of criticism, and it's not the "where's the beef?" kind of mockery. It's nitpicking by our own tribe. Jeff's quote above was response to that behavior. 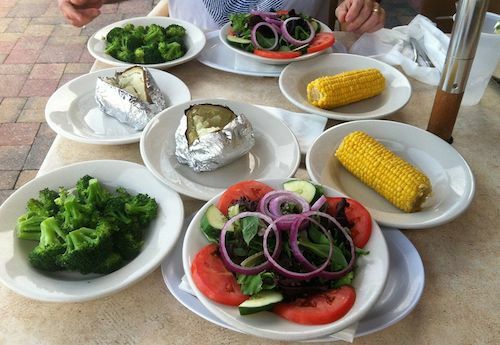 Specifically, he shared this picture (below) on social media to express his delight that he'd been able to find a beautiful, filling and healthy meal for $10 at a biker bar on the beach in Florida. Immediately Jeff's picture was overrun with negativity. Jeff said, "You would not believe the amount of viscous criticism the picture received. Was the corn organic? Was the broccoli organic? Was the corn GMO-free? Was the potato organic? Why was the potato wrapped in aluminum foil? etc etc etc Because of the amount of criticism, I eventually took the picture down. I guess it was just not good enough for most of the people posting and since a 100% organic, GMO-free meal, made without aluminum foil was not available, I should have had the fried shrimp platter, the bacon cheese burger, or the lobster feast." Jeff is a nutrition expert, one of the smartest people I know. If this is how he felt, imagine how Pam or Bob would respond (You'll meet them later in this post). Here's a real email I received this week, "I'm plant-based but I have gotten discouraged by the people chiming in with how bad canned beans are and I need to do everything from scratch and how easy it is to freeze 1 cup bags of beans, etc. Sigh, my freezer is well stocked already. Soon, I'll be told I need to grow my own beans, grow my own almonds for almond milk... I don't quite understand why some folks need to just raise the bar higher and higher as if it is an exclusive club where if you don't spend hours upon hours in the kitchen, you are not worthy." And this one, which came in AS I as writing this post: "I get a lot of "grief" sometimes from militants for not being a "real" veggie/vegan but "improvement, not perfection" is my goal, and it's obviously helped my health already! I know people can get really passionate about their beliefs/lifestyles/etc., but pointing and shaming can easily make some people just give up completely, when they would have gotten a lot of benefit from making even small changes." SO THERE IS NO CONFUSION: I'm not pro GMO or pro conventional food, or pro carrageenean, or pro BPA, etc. If I'm pro anything,I'm pro people going plant-based. But my point is, success with the plant-based diet is more important than ideology...because chances are, as time goes on, plant-based folks will continue to learn and make small improvements just as I have. Just as most of us have. 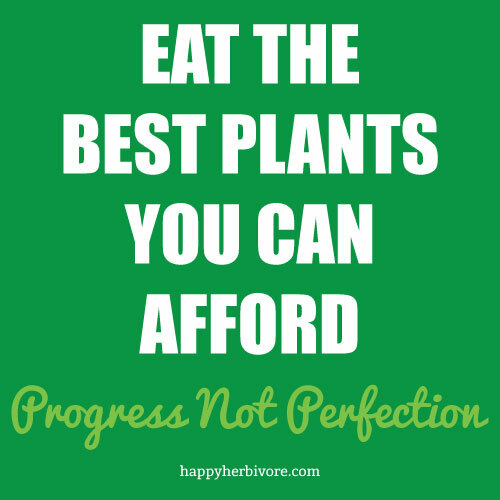 A Herbie said this once and I love it: Eat the best plants you can afford. 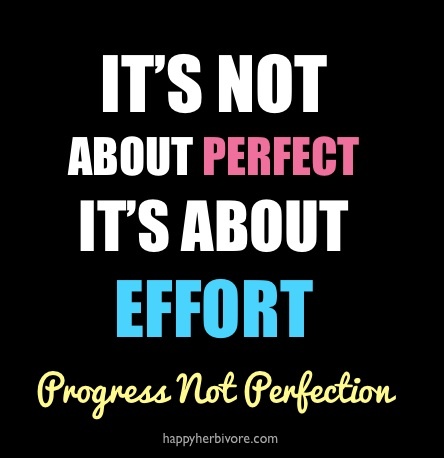 This is one of the many reasons why I preach progress not perfection... do the best you can, MAKE IT WORK! Maybe they won't find it as hard as they thought it would be. Maybe some things will be harder or easier than others. Of course just because something is hard or is challenging doesn't mean we shouldn't do it... I strongly encourage challenging yourself. Get outside your comfort zone daily! BUT even success in the end... reaching the proverbial finish line, doesn't retroactively make the race easy and not challenging. And here's something I'm almost scared to admit: A lot of times after I'm "victorious" I downplay how challenging it was for me to get there. "Oh YEAH. That climb wasn't bad at all." Translation: I only thought I was going to die three times. I think that happens with the plant-based diet and lifestyle, too. We forget those early days and early challenges and scared/overwhelmed thoughts when it's been our normal and reality for a long time. I've also come to accept that my experience is not everyone else's. My situation is not everyone else's, and I can't have the expectation that it is or that will be. My choices and practices are not the bar I should measure everyone else up against. You can also never know what someone else is battling or go through on the inside. You can never know what kind of circumstances or limitations they have whether it be geographical, financial, physical, spiritual, mental, or other. That's why I'm so passionate about preaching progress not perfection. When someone tells me "I'm not a happy herbivore yet because I still eat cheese sometimes." I tell them they ARE a happy herbivore... they're just at a different exit on the plant-based highway to health. We have to remember that the plant-based lifestyle is a JOURNEY and how long and winding that road is, is different for everyone. A lot of people get lost on the way. Switching to a plant-based diet from the SAD diet is HARD for most people. If we decided we wanted to start training for a marathon, we wouldn't expect ourselves to run 20 miles on the first day. Yet that's basically what we're expecting of others with an ideological plant-based diet. Here's what I do: When I'm teaching, advocating, or creating new products for my plant-based business, I don't think about me and my situation. I think about "Bob" and "Pam" who are totally fictional in my mind, but represent your average person living in Average Town USA. (Or sometimes I just think about my parents or extended family). Because I work for the internet and don't have a boss or a commute, I'm able to make a lot of food from scratch, but I know Pam can't. It's a struggle for Pam to find 30 minutes a day to walk because she works full-time, commutes an hour, has three kids, etc etc. Pam isn't lazy because she can't bake her own bread, she's triaging. We all triage in our own way and we need to. When I asked Jeff Novick MS RD if I should worry about using ingredient X sometimes, he asked me to list the top 100 things I'm most worried about. I tired long before this exercise was over, and as you can guess, if the potential dangers of ingredient X were going to even make the list, it'd be toward the very bottom. 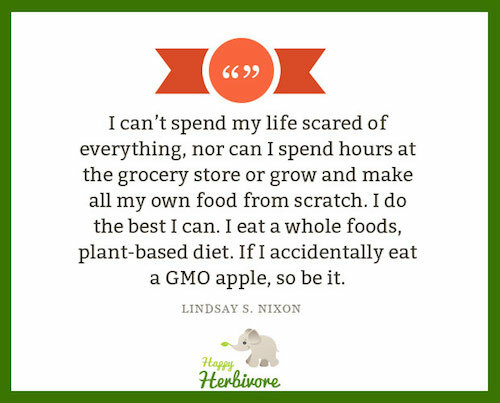 Maybe someone triages differently than you, or maybe they're just overwhelmed with all the changes they're already making that right now they just need to focus on eating healthy (healthier) foods and will get to the more refined changes later... Maybe right now GMOs, organics, pesticides, etc. are the furthest thing from their mind because it's taking every strength inside them to choose carrots over chips. Or what about "Bob" who has two minimum wage jobs and failing health. Bob takes the bus because he can't afford a car, and the bus stop is right outside McDonald's where Bob ate his breakfast and dinner every day for years. Now Bob wants to get healthy, but he still has his two jobs, his commute, and now he has to take a second, longer bus to the grocery store, where Bob will see that a bag of organic spinach costs as much as his Big Mac. Is a can of non-organic beans really going to be the end of Bob? I try to think about "Bob" and "Pam" -- their experiences and thoughts. Heck, I've been plant-based for almost a decade... and yet sometimes *I* get scared off, or defeated, and think "why do I bother, I'll never get this right. I'll never be perfect" because every day people are quick to tell me all the ways I'm doing it wrong. They sit and wait to tell me how I should be doing it better. To be certain these are not "fyi" and "helpful" comments. It's easy to tell what the motive is by the phrasing and the quickness in which the comment appears. Honestly, it's exhaustingand I'm sure I'm not alone in feeling that way. We'll change more lives... save more lives...if we do this. I feel I must also point out that to millions of people around the world, all of this bickering and perfectionista stuff would sound like epic "first world problems." I have been to places where the vast majority of people don't have electricity, running water, or enough food to eat. These things we fight over on our computers would be incomprehensible to them. There are many more places, even across the United States, Canada, and Europe, where the luxury of having more than once place to shop is... well.. a luxury. Where having access to food and a selection of food at all is a luxury. I can think of no better example than my friend Lisa who lives so far north in Canada that polar bears eat her trash. Nothing could be grown in that snowy, below zero climate. Everything had to be flown in. The closest urban population is over 8 hours away and many times of the year the roads are completely closed off. The work Lisa's husband does up there is extremely important. (Without families like Lisa's, many Canadians would be without electricity). That whole community of people up there would do just about anything to have a fraction of the resources others do in small town U.S.A.
Lisa inspires me every day with how she makes it work. Her family is entirely plant-based and vegan, and has been for several years. Getting any kind of vegetable in her kids is her priority. And then of course there are food deserts all over the U.S. where affordable and nutritious food is difficult to obtain, period. For me, getting vegetables and fruits in people is my priority. Success with the plant-based is more important than ideology. As I've said a hundred times: I'd rather someone eat a conventional apple over an organic potato chip, or conventional spinach over no spinach at all. I work with hundreds of real people every day. I hear their struggles. What they need is a little extra love and support. This is the second time this year I've talked about this issue. I wish I could say it's getting better, but it seems to be getting worse, especially on social media. In my first post Was I Wrong with my "Progress not Perfection" Mantra? I closed with the following, which I still think is true. Real winners build people up, they don't tear each other down... because it's not a competition. Be gentle with advice. Nudge. Encourage. Applaud progress... don't get mad because people don't live to your standards of perfection.